HIV Testing What are my Options? Advances in technology have provided us with a new way to test for HIV infection. Before we discuss that we should clear up a confusion that commonly exists about testing for HIV. Firstly AIDS is not a virus but a condition that HIV positive individuals develop. As such it is not AIDS testing we are concerned with but HIV testing. HIV testing, tests forthe HIV antibody. This means that in order for HIV to be detected by the current testing technologies the HIV antibodies must be present in your bloodstream. This is the same for blood testing arranged through your doctor, STD clinic or HIV clinic. All test forthe HIV antibodies. Problem is these can take up to 12 weeks to be detectable although many individuals will show antibodies within 4 weeks. So with that knowledge we can see that being tested for HIV in most cases is not an urgent matter, if you are testing within days of your potential exposure. It is important that you evaluate the testing options and choose the one that is best for you. We often receive enquiries at for urgent delivery of a HIV home test kit as an individual is worried about the results of a recent sexual contact. This type of urgent delivery serves no purpose and indicates the individual does not understand the nature of HIV detection. It is essential to wait and for that reason many clients use HIV home test kits at 4,8 and 12 week intervals. Why test at 4 and 8 weeks. Although a negative at 4 and 8 weeks is not conclusive, the odds of you having the virus and still not showing antibodies is significantly reduced, thus this testing method can reduce anxiety whilst waiting. It goes without saying that during this phase, you should avoid all contact that could potentially infect another individual until you can be certain that you have not been infected. This will mean waiting until 12 weeks after point of risk to ensure that you truly are HIV negative. This last point should highlight another issue. A negative result is not a certain indication a person is not carrying the HIV virus. It just is an indication that person does not have HIV antibodies in their bloodstream. Only when paired with a lack of potential exposure for 12 weeks can it be said with certainty that the individual is HIV negative? So which testing method is best for you? The following is a brief list of your options. Your doctor can refer you to a blood test (through a blood testing facility) and you will receive the results, normally through your doctor's nurse within 1 to 3 days. Often these clinics can take blood onsite and you will also receive the results within 1-3 days. These sites may also have professional advice/counseling for you. Often these facilities can test immediately on site and results can be immediate or within days depending on the testing method. Counseling is provided which is of great value to many individuals. These can be purchased through providers such as Head Start Testing NZ and are once delivered results are immediate. 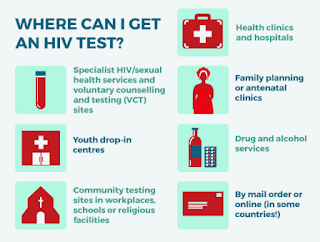 When carrying out a HIV home test you will of course enjoy greater privacy and convenience but it is important to remember that you will not receive counseling or emotional support.